WISE MEN WITH STARS IN THEIR EYES! Have you ever wondered what made the wise men of the Nativity story truly wise? They were actually more magicians than university professors so many of us today would not call their practices of discerning their direction from their daily horoscopes that smart of a deal! They depended more on tricks than truth. They were referred to as pagans by those who would define themselves as biblical scholars. Maybe they got their identity more by what they ended up doing rather than who they were before their journey to Bethlehem ever began. So what made these magi true wise guys with stars in their eyes? Well they were wise to seek the Baby King despite uncertainty, expense, and hardship. They were wise to seek a Jesus that even the Hebrews could not make time for. They committed to find him no matter what obstacles stood in their way. They didn’t know exactly where he was. They weren’t even that sure who he was! Yet nothing deterred their determination! They finally get to Jerusalem and realize they need even more input. How many of us would keep knocking knowing full well that we would have to get the local government involved? The officials surmise that they must go out of town to Bethlehem if they really want to meet the new King. That would mean another five or six miles. How many of you wouldn’t have made it to church last Sunday if it meant that you had to go by foot just five or six more miles? Yet these heroes hurried on and for that we have to give them credit for their street smarts! Too many times we homogenize that first Christmas story to almost be more fairy tale than factual. These guys put their lives and well-being in harm’s way. Remember, they were wandering from the east in a caravan that also included riches and treasures including pure gold. They were walking targets for bandits of the day! They’ve got to have security detail. They’ve got to watch over their gifts because they’re not from this country. They are clearly foreigners and that makes it more than just a little dangerous amidst a day that treachery ran rampant. Do you see where, for them, the pursuit of Jesus was the most important thing, more important than their comfort or their security, more important than their wealth or their stability? Nothing was going to stop them from paying homage to the King! Ain’t no mountain high enough and ain’t no river wide enough to keep them from getting to Jesus! This begs the question: How important is it for us to be with Jesus this December? Is it more important than anything and everything else? Have you been seeking Jesus? Am I seeking Jesus at that pace? Are you looking for him? Will you do anything to meet him? Do you want to get to know him? How badly do I want to be with him? If you look beyond the commercial chaos- you just may find the presence you are truly yearning for this Christmas! But you won’t discover it at the Mall! 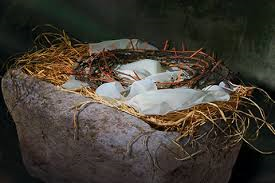 You will grasp it only if you go back to hold the baby born in a manger just for you! If you dig deep past mounds of wrapping paper- and if you can turn down the canned Christmas music- you might just be able to hear the angels sing. And their song is still inviting you to make room in your heart for the one to be born your Savior and your King! If you haven’t been to church in a while, then I am inviting you to join me as I open the pages of God’s Book to show you God’s Heart as seen in the greatest Christmas gift ever given to anyone. When Jesus came from heaven to earth on that Bethlehem night all those years ago- you were already on his mind! All weekend long, every weekend, you can enter the wonder now though Christmas Eve at The Lighthouse Church- Saturday at 6PM and Sunday at 9 and 10:45AM and on Wednesday Christmas Eve at 4 and 6 and 11:30 PM. If the wise men could do it, why can’t we? Maybe we need to humble ourselves and admit that perhaps we haven’t been as smart as we have claimed to be! Maybe this is a time to relearn what is timeless and true no matter what era our journey may be in. And maybe that night some 2000 years ago, that wasn’t so silent after all, may make some sweet new noise in our days both now and forever! I’ll meet you at the manger! We will be the ones with the stars in our eyes and the hope in our hearts!